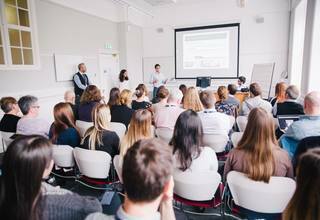 In this post, Matthew Lawson from the University of Edinburgh’s Department for Social Responsibility and Sustainability, gives an insight into developing practical training and learning opportunities for students in sustainable development. Edinburgh is not alone in experiencing this. Each year the National Union of Students in the UK (NUS) have asked students about their views on learning for sustainable development. For eight years in a row, around 80 per cent of students have told NUS that they want their institutions to be doing more on sustainability, and around 60 per cent of students want to learn more about it. Despite significant changes in further and higher education, the demand from students to learn about sustainability has remained consistent. This high level of interest has led to an increasing number of students and academic teaching staff approach our department asking for experiential learning opportunities for students. The ‘European Students Sustainability Auditing’ (ESSA) Project, of which the University is a partner, has been one such opportunity to address this interest. The project provides students with an opportunity to develop skills around social responsibility auditing, gain additional academic credit, work in culturally diverse groups of students and audit a European university. The overarching aim of the project is to better understand how universities from across Europe are addressing a range of diverse and complex social responsibility issues. By developing a flexible approach to student learning, through a Student Led Individually Created Course (SLICC) students have been placed at the heart of this project. Students complete a training course on social responsibility auditing, participate in a five-day audit of a University, produce an audit report and complete the SLICC by writing up their self-reflections on their development. The project has completed audits of the universities of Edinburgh, Kaunas and Porto, with a fourth audit taking place at King’s College London in March 2019. Over 30 students have completed the training course and over the next month, the next cohort will participate in the training. The cohort of students has had a mixture of both undergraduate and postgraduate, and includes students from a diverse range of academic and cultural backgrounds. This diversity has certainly contributed to productive group work and discussions, with students presenting and engaging with a range of different viewpoints. 93% of students said their participation in the project exceeded their original expectations. Based on the feedback, students clearly feel this approach to learning is beneficial and one that should be more widely experienced by students. It has also been useful to understand the skills that students wanted to develop. This includes communication skills, team working, problem-solving, creative thinking, ethics and social responsibility. Students have indicated that they see these skills as important for their future employability and want more opportunities to practically apply them. From a facilitator’s point of view, we have been able to apply and evaluate a range of techniques to deliver the training, support group work and encourage students to reflect on their learning. We have also recognised the importance of inspiring students and empowering them, especially in terms of creating a positive learning environment for all involved. It has also reinforced our belief that students are looking for diverse ways of learning about sustainability and developing their skills. Above all, we have been struck by the passion and the high level of importance students attach to social responsibility issues. They understand that we are living in a changing world, and that climate change and sustainable development will continue to be important issues no matter what sector they work in.